Hawksmoor serve the best steak I have ever tasted in their three restaurants in London – Covent Garden, Spitalfields and Guildhall. I mean it’s melt-in-the-mouth amazing. We went to the Covent Garden restaurant a few weeks ago as a treat for my husband’s birthday and it was glorious. We started with cocktails in the bar area from their extensive list, it took about 10 minutes to choose as the descriptions were all so wonderful. In the end I went for a Hawksmoor Fizz and my husband was won over by the description of shipwrecked oak barrels that the brandy for his Shipwreck Sour was aged in. The decor of the basement restaurant is stunning, with dark wood parquet floor, leather chairs and solid tables it is what I imagine a gentleman’s smoking room to be like (but with no smoke). I almost expected to smell sandalwood when I walked in. There’s a beautiful row of mismatched sliding doors that separates off part of the restaurant and had me hankering for our own version at home. When I booked the table I mentioned we were celebrating a birthday and the staff were so friendly and gave us each a glass of Prosecco and my husband’s pudding on the house. Ordering is slightly different here if you are having steak. You choose from the different cuts available on the day and order and pay by the weight so that everyone at the table eating steak shares the same cut of meat. Be warned, if you start ordering the Chateaubriand it can get expensive quickly, but there’s also an express menu so it is possible to spend much less. We had a fabulous birthday lunch, the highlight for me (apart from the steak) was the peanut butter shortbread with salted caramel ice-cream. Heaven in each salty, nutty, creamy, caramel mouthful. This was our second visit to the Hawksmoor but for us it’s the kind of place we’d only go to as a real treat. 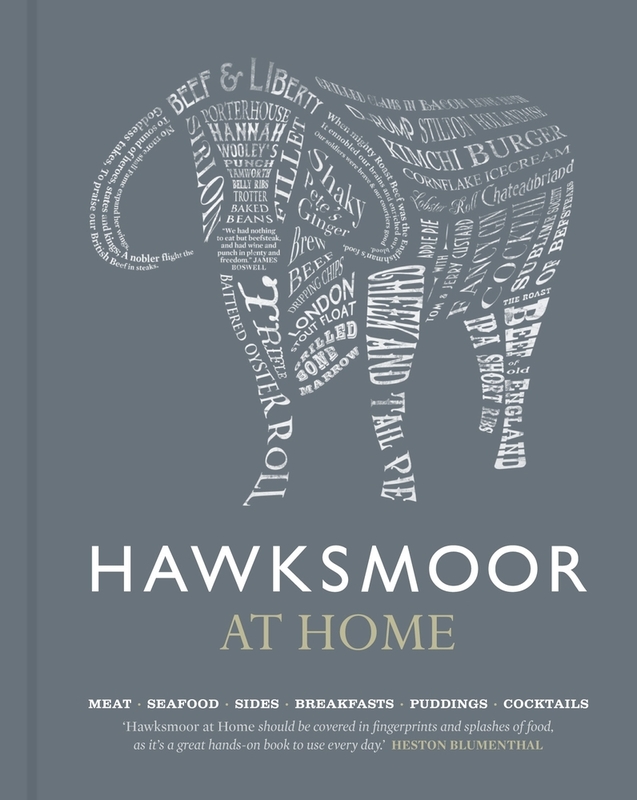 But now Hawksmoor have put their recipes in a book ‘Hawksmoor at Home’ I can try to recreate the dishes at home. Don’t think it’s just steak in this book, the recipes are so varied and there’s lots of information. The sauces are inspiring, the Stilton Hollandaise recipe is at the top of my list to try. As I’ve mentioned before I’m quite scared of cooking seafood but the guides on preparing seafood in this book are clear and not at all scary looking. The cocktails sound delicious and there is a whole chapter on trifles. So far I’ve made the Potted Smoked Mackerel which was very fishy but creamy too and had a nice tang of horseradish. The pickled cucumber to go with it is really simple but tasted wonderful and cut through the buttery fish perfectly. You can order Hawksmoor At Home for £20 and all proceeds go to Action Against Hunger. It says on the website that shipping is ten days but mine was delivered within four days.